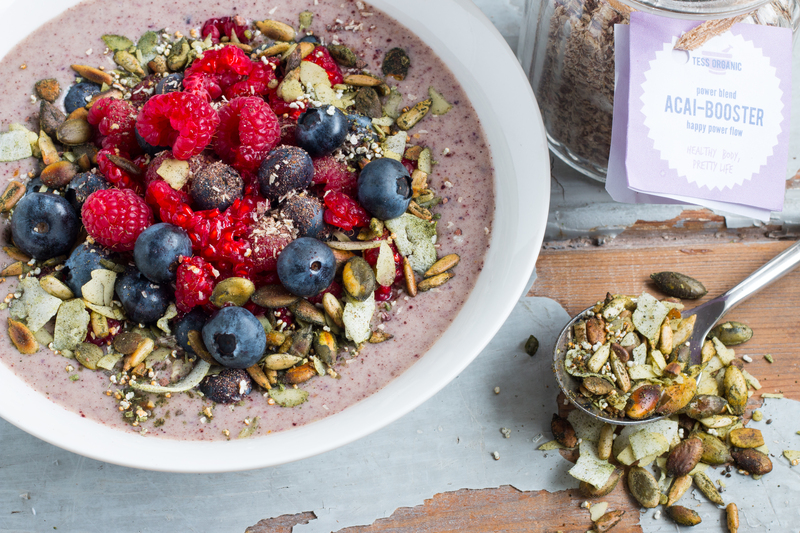 A couple of weeks ago I discovered the ‘smoothie breakfast bowl’ for the first time through the Instagram account of blogger Luise from Green Kitchen Stories (this photo, to be precise). It’s really simple and I was surprised that I’ve never thought of this before: make your smoothie slightly thicker and put it in a bowl with some fresh fruit and your favourite superfoods. That’s it! Healthy, simple, delicious and ready within 3 minutes. Blend the almond milk with the frozen berries & banana. Add the acai powder and blend untill smooth. 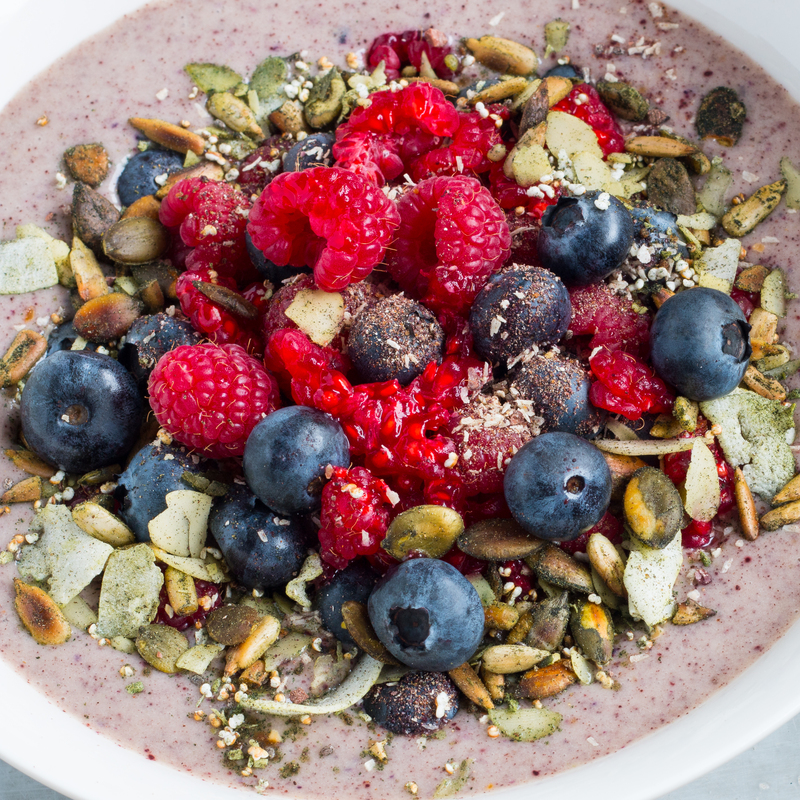 Pour into a bowl and add fresh fruit, nut mix & superfoods mix. Done. Enjoy!! 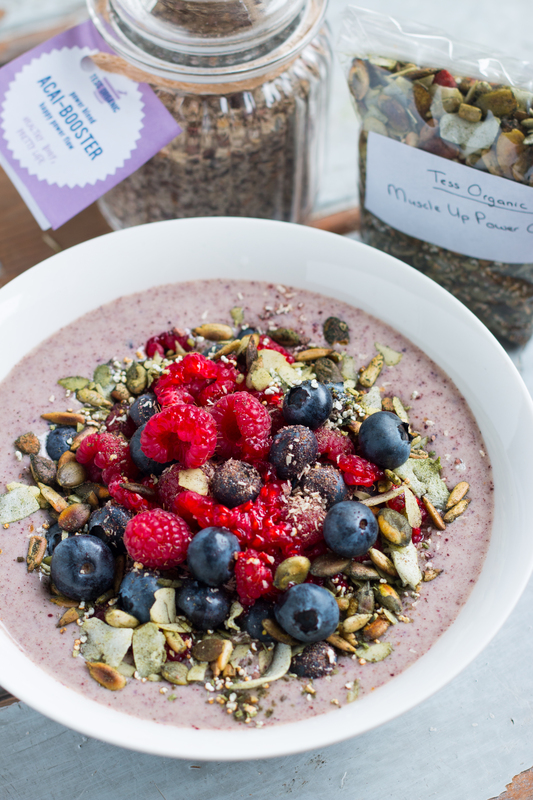 For my Dutch followers, be sure to check my Dutch blog too – it has a Tess Organic give away! Sorry for my international followers (sad face).. In the future, I’ll try to collaborate with international organic brands as much as possible :). hello Rosalie. Ik love your pictures but I live in Holland and many of the products have different names or packages. It was fun but would you cancel my news letter from Rosalie’s Recipes please. Thank you for helping people to stay healthy. Hi Rick! I live in Holland too :). Have you seen my Dutch website rosalieruardy.nl? Might be more your thing. You have to cancel your newsletter yourself, simply follow the steps in your email (at the bottom). Good luck and sad to lose you :(. I discovered your blog few days ago, it is lovely and all the receipes look yummy! Do you know if Tess Organic would ship outside of Holland? Do they have an english version of their websire. I would be very interessed in the Acai Bosster! Hey Melanie, thanks! Good to hear. I’ll ask her and get back to you ok? Oh yes Rosalie, that would be great! I live in the UK at the moment. But will be back definitely in France soon. So whatever contry!